NEW YORK CITY, Dec 15, 2017 – GFNY, the global cycling marathon series continues to expand its GFNY World event calendar with the inaugural GFNY Portugal to be held on September 9, 2018. The race will start and finish in Cascais. Cascais is situated 30km from the capital of Portugal, Lisbon. Once an important seaside resort of kings and queens, it’s nowadays famous as the Portuguese Riviera, with beautiful beaches, great cuisine, cosmopolitan character and a glamorous marina. Cascais is also arguably the best cycling destination in Portugal. The long route will cover 162km with 2281 meters of climbing and serves as a qualifying race for the Racer Corral Qualification at the 2019 Campagnolo GFNY World Championship in NYC. The non-competitive medium route covers 82km and 1120 meters of climbing. As competitors leave behind the glamorous Marina in Cascais, they will head towards Lisbon before returning to Estoril, passing the iconic Formula 1 racetrack. Riders will continue to Mafra toward the Atlantic Coast, passing through the coastal villages of Ericeira and Azenhas do Mar. The Serra de Sintra is the course’s most challenging climb. The route is a perfect celebration and tour of Portugal’s palaces, historical ruins and coastal villages. 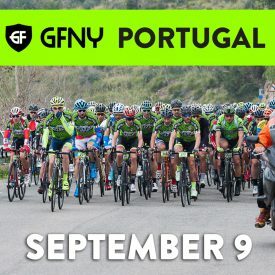 Registration for GFNY Portugal is now OPEN. GFNY is the global cycling marathon brand with events held in NYC, Argentina, Bali-Indonesia, Brazil, Chile, Colombia, Costa Rica, Germany, Samosir-Indonesia, Italy, Jerusalem-Israel, Malaysia, Cozumel-Mexico, Monterrey-Mexico, Poland and Uruguay.